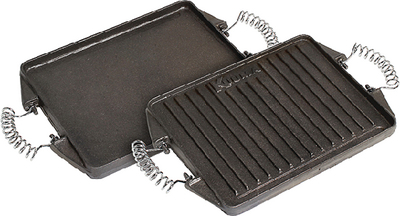 The Cast Iron Griddle is designed for use on your grill at home or camping. The two-sided griddle has a smooth side for cooking pancakes and frying eggs, and a ribbed side for cooking meats. The high quality cast iron griddle evenly distributes heat and becomes seasoned over time with proper use, for added cooking flavor. Convenient stay-cool handles make the griddle easy to use.